I’m so far behind on getting something posted about Christophe Pourny’s new reference book “The Furniture Bible: Everything You Need to Know to Identify, Restore & Care for Furniture” that I’m surprised the publisher hasn’t shown up in my shop to beat me with it! Then again, the more I think about it, the more I’m convinced my delay in cracking open “The Furniture Bible” is a good thing, especially given the recent emergence of two new furniture design shows on television. I’ll tell you right from the beginning, just like with the new television shows, Christophe’s book is not a “how-to” book in furniture construction. In the beginning there is some great general information about how furniture is constructed, but it’s my impression that the author’s intention isn’t to teach the reader how to make pieces, but instead to give them a cursory understanding of the topic. As to the end result of that goal, I found myself learning a few things about the evolution of furniture from “roughly the 5th century” all the way to the “20th century” as Christophe uses chairs as the center of his examples in how design changes and adapts to the tools of the time, the style and fashion of those periods, and to the needs of the people who lived in those eras. And along the way he also injects some interesting historical snippets to help make his point. As for the rest of this first part of the book, Christophe discusses topics such as “common wood species” used in furniture construction, in which he charts them to show the reader what their typical color is, characteristics, what period they were most commonly seen in, and then what kind of projects they were used for and even which finishes work best with them. The author then moves on to topics covering the cuts of wood, and even types of traditional joinery used. 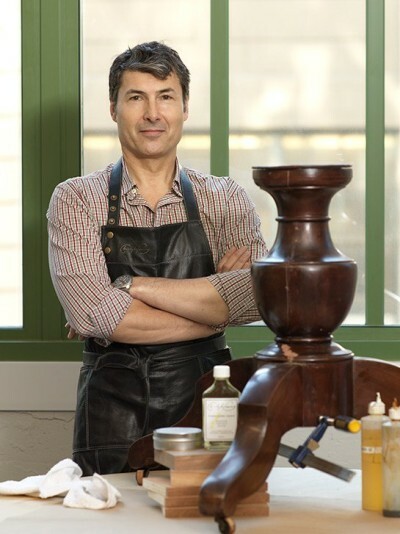 Perhaps the one part of the book I enjoyed reading the most (because I struggle with it all the time) was the portion titled “Finishing School.” Here Christophe covered topics in finishing ranging from an overview of Wax finishes, Hand Lacquer, Shellac, oils to gilding and paint. While it’s not a finishing book like others already on the market I found “The Furniture Bible” to also have some great information about this topic. Especially in the form of helpful identification tips, the history of the technique and especially the pros and cons of using it. At this point in the book topics such as dismantling an existing piece, stripping it to bare wood, dewaxing, filling holes and cracks, sanding, staining, sealing, and more is covered in great detail. And then to help the reader take it the next step, the author included another section discussing and demonstrating twelve different finishing techniques along with a discussion on wood & veneer repairs. What I found extremely useful about this part of the book was that each of these twelve finishing techniques weren’t just discussed, they were presented with easy to follow instructions and details (including troubleshooting tips) to help the reader to have a successful result when they try it themselves. And what would a book with a title such as “The Furniture Bible” be without a discussion of the tools to complete the tips and techniques discussed within it, and also a section on the care of furniture pieces to maintain them for the longterm? Overall, if anyone was looking for a good book on furniture identification, restoration or a “how-to” on getting great results and improvements on a wide variety of finishing techniques, Christophe Pourny’s new reference book “The Furniture Bible: Everything You Need to Know to Identify, Restore & Care for Furniture” is one that should be on their list of suggested reference guides. To purchase your own copy of Christophe Pourny’s “The Furniture Bible: Everything You Need to Know to Identify, Restore & Care for Furniture” from Amazon.com click here. Bob Lang’s “Great Book of Shop Drawings for Craftsman Furniture” Now Available!